All pies are 11 inches in diameter. They are all pre-sliced for 10 slices. Each slice is separated by wax paper and is roughly 5-6 ounces. 1- Traditional (Hot fudge Sundae) - A chocolate cookie crumb crust with generous layers of our creamy vanilla and chocolate ice cream, is finished with hot fudge and pecans. 2- Caramel Pecan Nut - This pie combines mountains of nut flavored ice cream and mammoth pecans in a deliciously delicate and light graham cracker crust. Topped with caramel. 3- Chocolate Peanut Butter Cup - Tiny peanut butter cups and hot fudge sit atop layers of velvety smooth peanut butter mousse and rich chocolate ice cream in a chocolate cookie crust. 4- Cappuccino Coffee - A chocolate crust embraces layer upon layer of our cappuccino coffee ice cream and hot fudge. 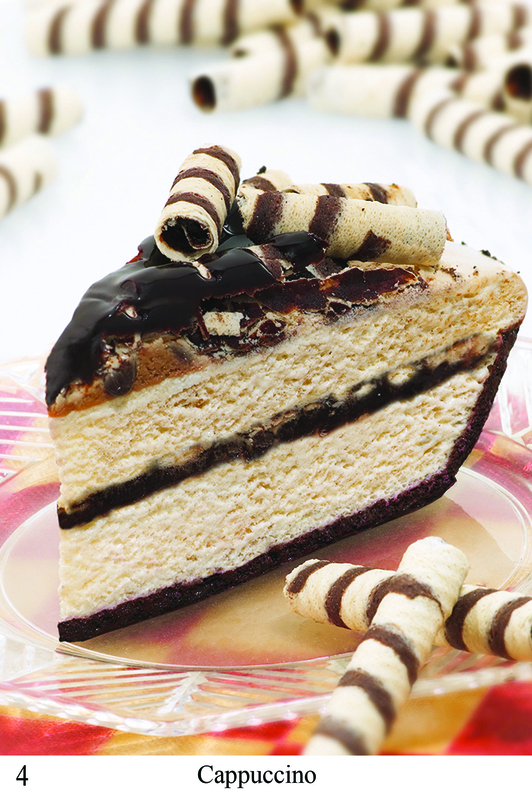 It is accented with chocolate marble pirouette swirls to create this model of gourmet goodness. 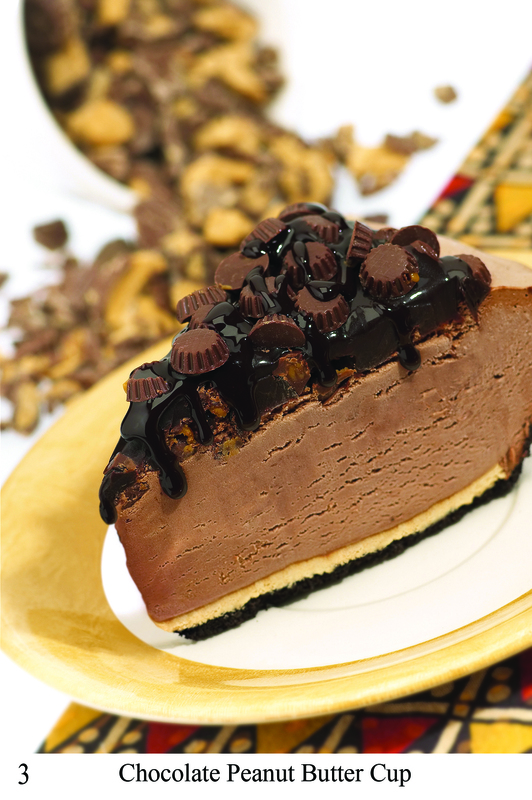 5- Candied Ice Cream Pie made with Heath ® Bar stir-ins - We start with our chocolate cookie crumb crust, then we add Heath ® Bar stir-ins, nestled between two generous layers of our creamy vanilla ice cream and fresh butterscotch. 6- Cookies & Cream made with Oreos™ - Our famous chocolate cookie crust cradles generous layers of our creamy vanilla ice cream with mounds of Oreo™ cookies, and swirled hot fudge. 7- Mudslide - Our exceptional favorite begins with a chocolate cookie crumb crust. Filled with layers of coffee and chocolate ice creams, topped with chocolate sandwich cookies, hot fudge and toasted almonds. 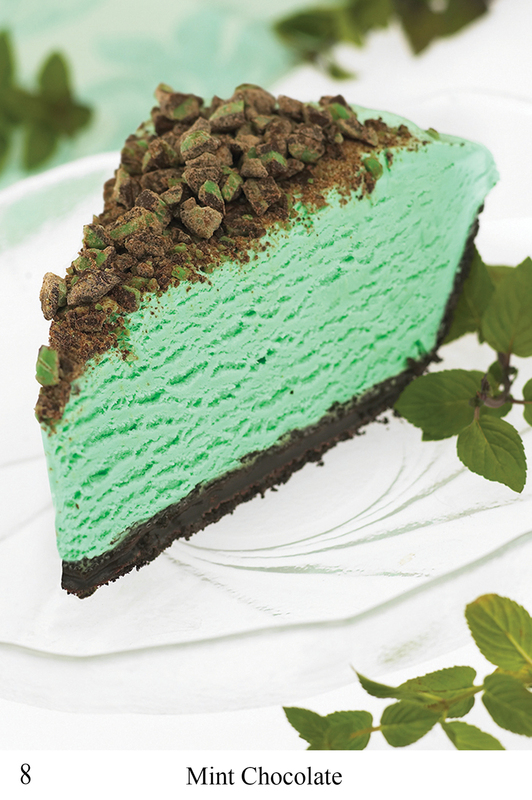 9- Key Lime- A graham cracker crust enhances a light and refreshing key lime ice cream, need we say more! 10- Orange & Cream - We begin with a graham cracker crust, add creamy vanilla and orange ice cream to create your childhood favorite.